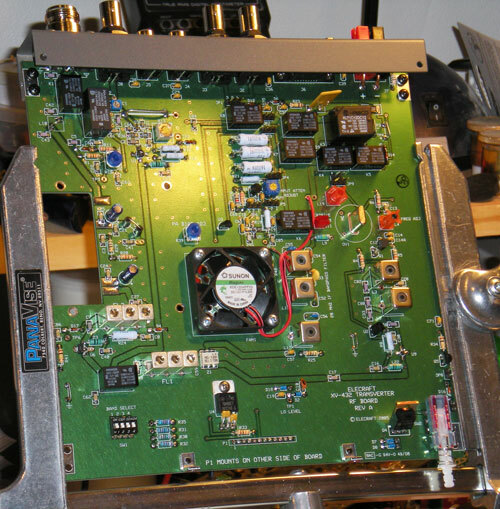 The transverter is pretty much done. The remaining piece is the final power transistor as the case is put together. I will try to tackle that sometime on Monday as it only take a few minutes to finish that up. I actually need to test my Elecraft K2 on SSB prior to aligning the transverters and integrating them with the amplifiers. I have had the SSB board in my K2 since it was built but I have never tested it, nor have I even hooked up a microphone to that rig... it has been CW only so far. I would guess that I probably have about 5 hours into this kit with all of the starting/stopping and distractions. With some luck maybe I will have it on the air over one of the next couple of weekends as time permits.